Alliant Credit Union, the 6th largest credit union in America, has over $8 billion in assets and serves 270,000 members nationwide. The company needed to update its existing alerts system for its customers in such a way that it would be able to match the services offered by leading banks and financial institutions. 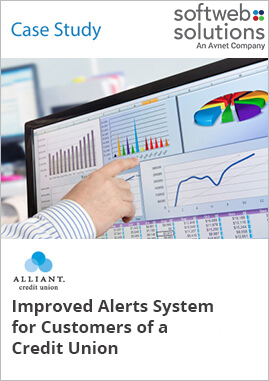 Softweb Solutions created an alerts system for Alliant’s customers that was user friendly and allowed them to view and set alerts for all their Alliant accounts through one single interface. Customers have full control over which alert to receive and when to receive them. Users get the ability to filter alerts based on various criteria. (check deposit, NSF etc.). Alliant saves operating expenses by giving customers more control over their accounts. The alerts will be sent out based on settings such as Amount Balance, Check Cleared, etc.